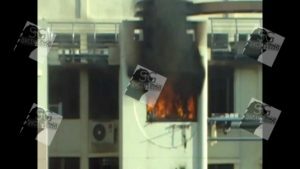 Woodlands flat set on fire by loanshark !! You are at:Home»Caught In The Act»Woodlands flat set on fire by loanshark !! Singapore – In the wee hour of Sunday, a unit in Woodlands street 31 block 318, 7th floor was set on fire. An 18 year-old ITE student was woken up by a very strong burning smell and smoke which had actually spread into the victims quarter at approximately 3.30am. Alarm and shocked, she quickly reacted and headed straight to the balcony which is located at the back of the kitchen had prompted her to alert mode as she began checking on the origin of the burning smell. As the smoke began to form thicker she had to leaned outside of the balcony window diagonally and notice that her neighbor house was caught on fire. Her only support was holding on to the window panel catching for breath. When the neighbor found out that a unit on the 7th floor was on fire, they immediately contacted the civil defence force and tried to helped by spraying water into the unit and 18 year-old ITE student with a hose that was connected from her kitchen tap. 5 Minutes was only what it takes for the Singapore Civil Defence Force (SCDF) to arrived. The flare-up of the flames is believe to be associated with a man with involvement and outstanding payment with a unlicensed money lender. This had attracted a crowd of people to be gathered / evacuated at the foot of the block. The house front door was completely burned together with the living room content that are almost burned to ash. The man that had caused this had his name and IC number written on the wall beside the flat that was burned. Had commented that he had not taken any loan from the loan shark and was merely a guarantor for this his friend. Since moving out of the flat for more than a year.. he returned to “collect items which he forgot to take” The total amount that was loan : SGD$800 but due to not fulfilling on the payment schedule the amount was eventually accelerated to S$2400. His unit was not affected as their unit has 3CCTV their house objects were found missing. A additional camera was installed after this incident and he has given his statement to the police. The police had classified as a case of unlicensed money-lending activities and investigation are ongoing.